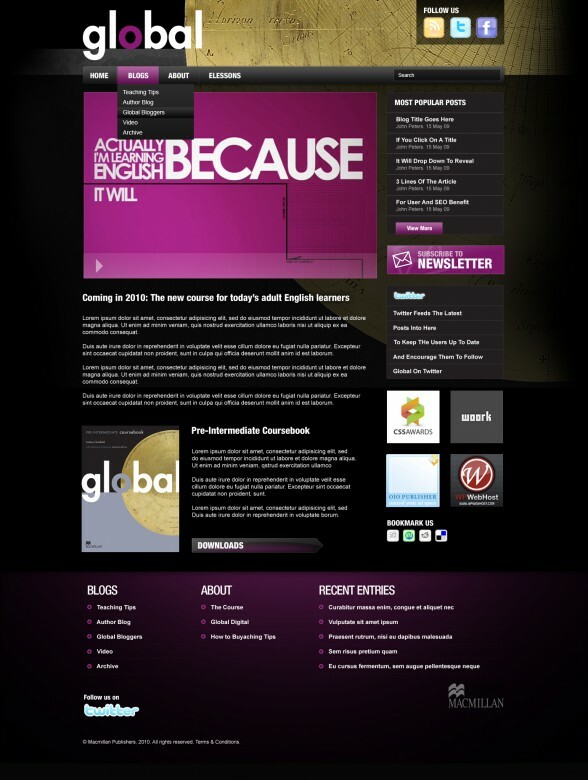 We’re very pleased to hear of the success of http://www.macmillanglobal.com in the TEFL.net Site of the Month Award. Global won the award for February due to their valuable teaching resources and all-round contribution to English language training. The site has achieved great success already in terms of visits and newsletter subscribers. We’re confident that this success will continue due to their commitment to high quality content. The site offers audio and pdf downloads, videos and frequent blog posts about their course and broader issues relating to teaching and learning English as a foreign language. The blog section features the writing of well-respected contributors such as David Crystal and Linsay Clandfield. We are proud of the web design and our contribution to presenting their content in an effective, visually-appealing manner and we hope to see the site continue to achieve Macmillan’s goals in award-winning style.